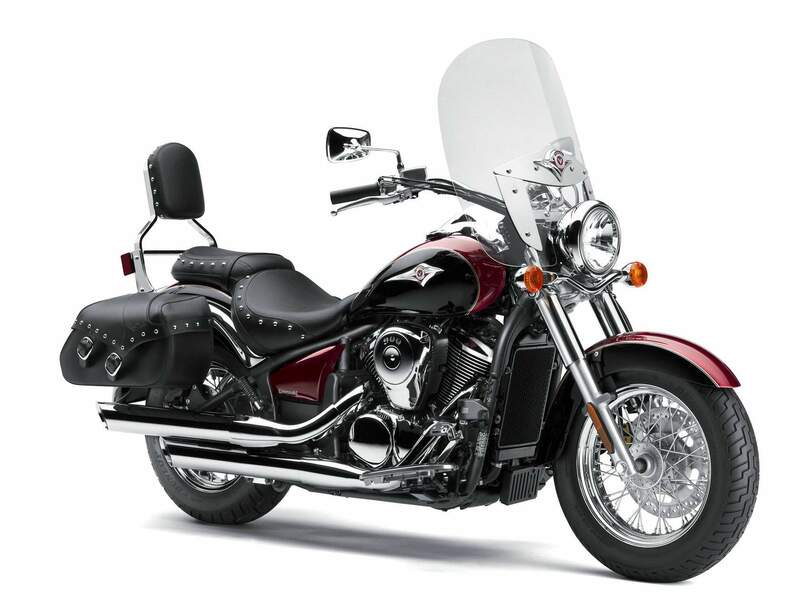 The road-ready Vulcan® 900 Classic LT is the perfect ride for those looking for a big tourer without the big sticker price. This V-twin powered cruiser comes complete with all the touring accessories you’d expect: stylish saddlebags, an adjustable windshield, and a passenger backrest. 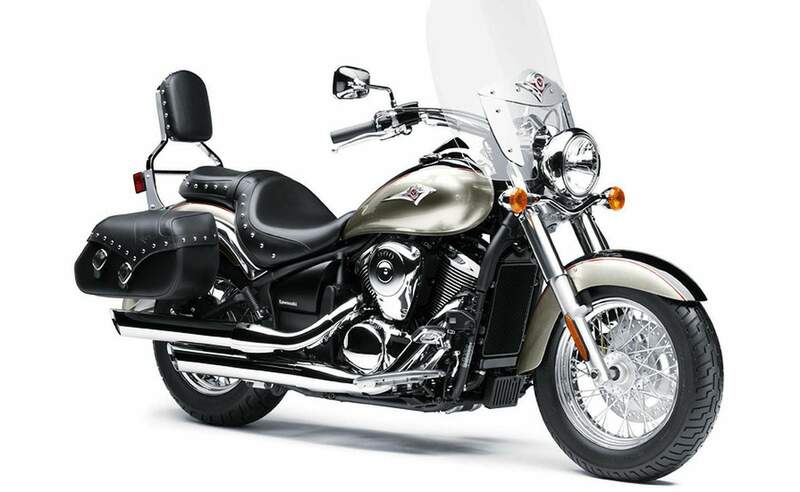 Add in the styling details that make this a Vulcan cruiser, including a chromed brass studded seat that matches the passenger backrest, and it’s a smart choice to take on the road. 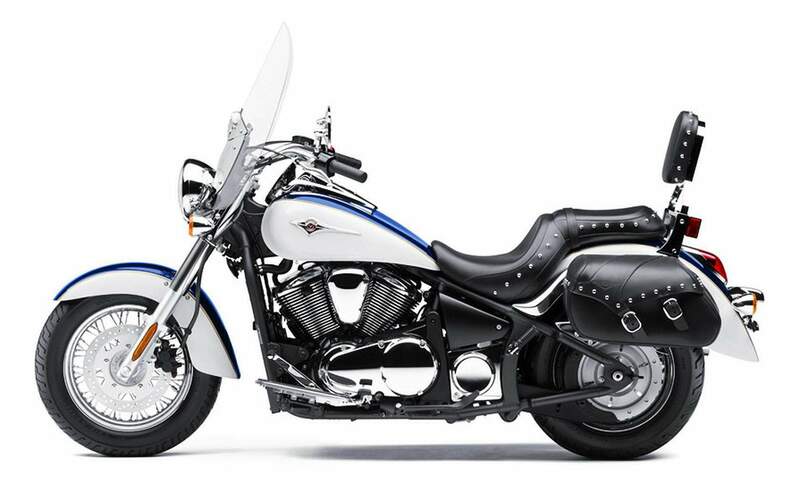 The LT comes equipped with the same excellent fuel-injected 903cc engine as the Vulcan 900 Classic. This powerplant delivers exceptional roll-on acceleration, and the nimble chassis adds to the LT’s flowing cruiser beauty. Its eye-catching touring features only add to this winning mixture of mid-displacement agility and large-displacement power and torque, sure to please any rider itching for a long road trip. At the core of the Classic LT’s touring package are striking, top-grain, reinforced cowhide saddlebags. The leather is carefully selected to minimize flaws and deep-dyed to prevent scraping off the finish. The ideally sized bags feature a slant-top opening held shut by two 1.5-inch wide leather straps fitted with chrome buckles and stealth quick-release fasteners. The rolled and riveted top lids, along with metal reinforced upper edges on the bags, help maintain shape and keep unwanted moisture out of the bags. An embossed Vulcan logo on the reinforced dual-panel lids and chrome-plated brass studs finish off the look of these bags. A comfortable seat for both rider and passenger are a must on a tourer, and the Classic LT has both, along with a backrest to keep the passenger relaxed as the miles tick by. Both the seat and the backrest are detailed with chrome-plated brass studs to match the bags. A thick, optically correct, acrylic plastic windscreen delivers smooth airflow around the rider and passenger, reducing wind fatigue and bug strikes over the course of long rides the 900 Classic LT encourages you to take. Once past the 900 Classic LT’s handsome looks, owners will discover themselves enjoying a ride that was previously found only on larger cruisers. Applying lessons learned on Kawasaki’s Vulcan 2000, the Vulcan 900 models deliver exceptional roll-on acceleration, easy maneuverability, and performance that rivals larger displacement competitors. Breakdowns can ruin any trip. The Vulcan 900 Classic LT utilizes a low-maintenance belt drive not only to help avoid undesired stops, but also to save weight and keep the rear end rolling in high style. Speaking of rear-end styling, the 900 Classic LT sports a large, 180mm-wide rear tire – the largest in its category. The beefy tire’s appearance augments the classic V-twin rumble courtesy of a single-pin crankshaft. It’s this look and sound that suggest a much larger motorcycle. However, the Vulcan 900 LT’s big footprint shouldn’t alarm potential riders. Its low seat and narrow chassis rails blend comfortably into the fuel tank, which translates into plenty of accessibility for shorter riders and comfort for those of all sizes. 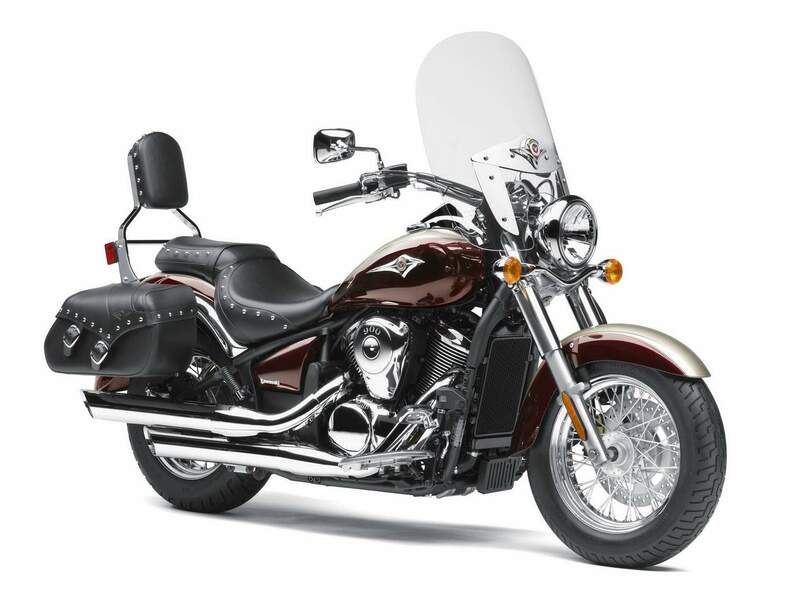 Wide handlebars ideally situated with the seat and floorboards, coupled with roomy passenger accommodations, make the Vulcan 900 Classic LT a real joy – whether it’s just a run to the store or a multi-day haul across the country. The Vulcan 900 Classic LT is available in the following two-tone color combinations: Metallic Moondust Grey / Ebony and Pearl Burnish Beige / Metallic Majestic Red. 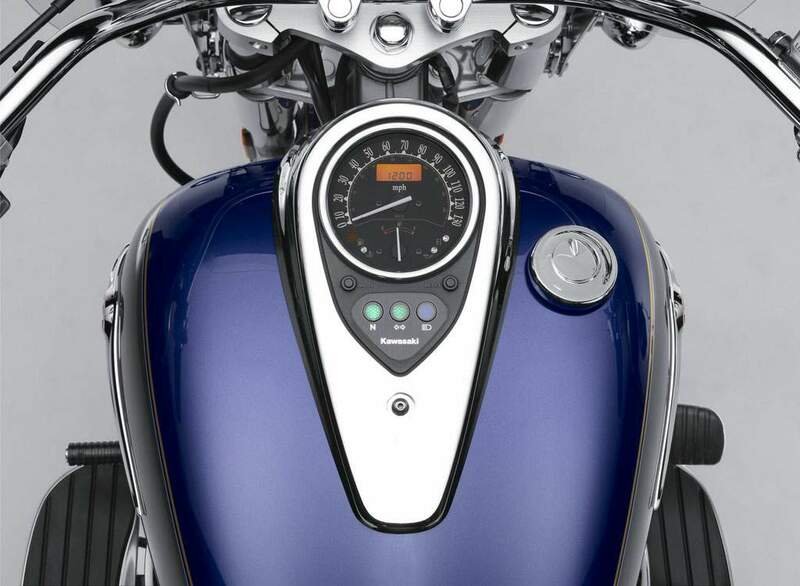 Whatever color you choose, the Vulcan 900 Classic LT gets noticed by everyone it passes.